Model train maker Hornby is to buy fellow UK collectibles business Airfix for £2.6m ($5m). Hornby will take control of the Airfix model kit company from administrators at Airfix's parent firm Humbrol. Humbrol went into administration in the summer, and the deal also includes the firm's paints and accessories business. Hornby made the announcement as it unveiled a pre-tax profit of £1.4m for the six months to 30 September, down from £2.5m for the same time last year. "We are delighted to have acquired Airfix and Humbrol, both of which are iconic brands in the hobby market," said Hornby chief executive Frank Martin. "The strategic fit with Hornby is excellent." 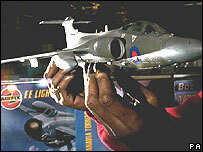 In 2005, the Airfix and Humbrol brands had combined sales of £6.5m. Grant Thornton, Humbrol's administrators, said the deal was in the best interest of the Airfix brand. "This transaction provides the best opportunity to preserve and develop what is an iconic brand," said joint administrator Keith Hinds. Hornby said it will move the distribution, sales and marketing of Humbrol and Airfix to its own site in Kent, and outsource the manufacturing and assembly arm. Humbrol's existing plant in Hull closed when it went into administration with the loss of all jobs but a skeleton crew. Sales at Hornby dipped to £17.9m in the six months to September, from £18.5m a year earlier. It put the fall down to the World Cup and the hot summer, which it said was "not conducive to indoor hobby activities".